Very few people throughout history have had the title “emperor” bestowed upon them. 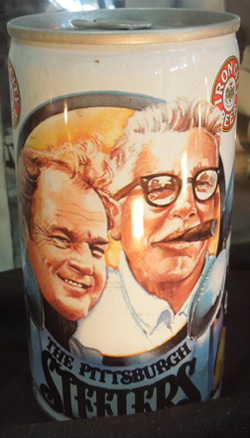 There’s the Roman heads of state, Napoleon, and Chuck Noll. Although not a leader of a country, the late Steelers coach headed the Steelers nation and led his team to four Super Bowl victories, more than any other coach in NFL history. He held that title solely until 2015 when Patriots Coach Bill Belichick tied him with four championship rings. The late legendary sportscaster Myron Cope fittingly crowned Noll with his emperorship, and this quiet, unassuming man wore it well. 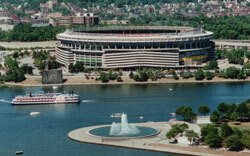 Charles “Chuck” Noll ironically was born in Cleveland, Pittsburgh’s rival city, in 1932. He was an outstanding high school football athlete at Benedictine High School, where his prowess on the gridiron earned him a football scholarship to the University of Dayton. In 1953, he was drafted by the Cleveland Browns. He spent his entire pro football career with the Browns, retiring in 1959. 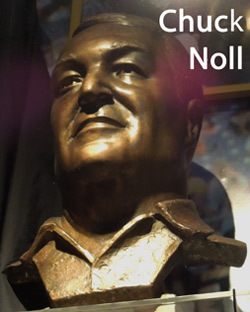 From 1960-1961, Noll served as an assistant coach with the American Football League’s San Diego Chargers, coaching the defensive line. Under Don Shula, he served as the defensive coordinator with the Baltimore Colts from 1966-1968. During the 1968 season, the Colts went 13-1 and set the NFL record for the fewest points allowed (144). The Colts won the NFL championship that year 34-0 but lost in Super Bowl III to the AFL Champs, the New York Jets, 16-7. Noll’s success as an assistant coach didn’t go unnoticed. In 1969, after Penn State coach Joe Paterno turned down the position of head coach for the Pittsburgh Steelers, Chuck Noll was offered the job, becoming the Steelers 14th head coach. 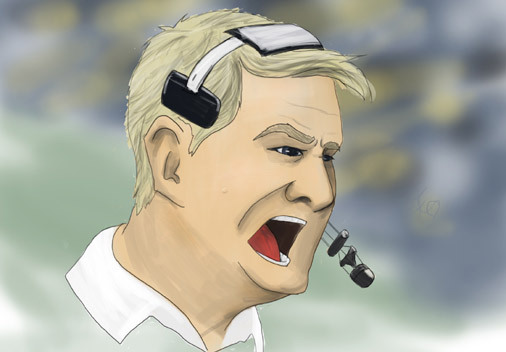 When Noll was hired, he took the helm of a hapless team, who having come off a previous season record of 2-11-1, the NFL’s worst record that year. When Noll took over, he was charged with the unenviable task of turning the team around. He employed the defensive expertise he had perfected in his previous positions, instituting what became known as the “Steel Curtain Defense.” The task was not easy. In his first season as the Steelers’ skipper, Noll coached the team to a dismal 1-13 record. Noll set out to purge the “dead wood” on the team. In 1969, the Steelers selected Joe Green in the NFL draft, the first of many pieces that would comprise the Steelers’ legendary defense. In the 1970 season, the Steelers made some progress, upping their record to an anemic 5-9, but during that year’s draft, two key players were added: Terry Bradshaw and Mel Blount. The next season the team racked up one more win, finishing the 1971 season with a 6-8 record. The dawn of a new era in Steelers football arrived with 1972 season, the team’s 40th Anniversary. After several years of struggling, the Steelers under Coach Noll went 11-3 and won the franchise’s first-ever AFC Central Division Championship. The team lost to the undefeated Miami Dolphins in the AFC Championship match. Winning soon became a habit. In 1973, the Steelers, once again, went the to division finals but lost to the Oakland Raiders. During the 1974 draft, the Steelers selected Lynn Swann, Jack Lambert, Mike Webster, and John Stallworth. All four would be taken into the Pro Football Hall of Fame. The Steelers were the only team to ever select four hall-of-famers in one draft. The team went 10-3-1, eclipsing their previous success and meeting the Minnesota Vikings in Super Bowl IX, where Noll’s Steel Curtain defense held the Vikings to a paltry 17 yards rushing, earning the Steelers their first Super Bowl championship. In a matter of years, Noll took the Steelers from the NFL’s cellar to its first championship. Success is an intoxicating elixir. The team entered the 1975 season as defending champs, but it not only improved on its regular season record (12-2) but also capped the season with another championship in Super Bowl X against the Dallas Cowboys. Third time was not the charm for the Steelers in 1976. The had hoped to run the table and win their third Super Bowl in three years, but the team lost in the AFC Championship to the Oakland Raiders. The team failed again in 1977, but in 1978, Noll’s defensive acumen asserted itself. The team had the fewest points scored against them (195) in the league, and they parlayed this into the team’s winning their third championship in Super Bowl XIII against the Dallas Cowboys. The team sent a remarkable 10 players to the Pro Bowl that year. In 1979 the Steelers once again triumphed in Super Bowl XIV against the Los Angeles Rams, giving the team an unprecedented fourth Super Bowl ring and the distinction of being the only team to ever win back-to-back Super Bowls twice. with a record of 209-156-1, and he was selected to the Pro Football Hall of Fame in 1993. While Noll’s successes as a football coach are legendary, to ignore his other accomplishments would be a disservice to the man. Myron Cope described Noll as a renaissance man. Noll flew planes, sailed boats, gardened, cooked, and was a wine expert as well as a student of history. After retiring from football, Noll and his wife Marianne got on with their life together, dividing their time between residences in Sewickley and Florida. In his later years, he suffered from poor health and died on June 13, 2014. A devout Catholic, Noll’s extraordinary life was celebrated with a funeral Mass at St. Paul Cathedral. The Mass was simple and humble, reflecting the Noll’s nature. Some are winners on the field while some are off. It is the rare man who is a winner both on and off the field, and Pittsburghers count themselves fortunate to have been around during the reign of Emperor Chaz.